Currently -at time of writing, October 2018: The 5G standards are not yet finalised by the 3GPP and the most advanced services are still in the pre-commercial phase. In fact, we probably won’t see any commercial 5G services before at least 2020, so it’s impossible to say definitively what speeds will be reachable. However 5G speeds will be significantly ahead of what’s currently available with 4G. A minimum expectation for commercial 5G services is for them to be tens of times faster than 4G, which would make even current broadband speeds look sluggish in comparison. And while the exact speeds that can be delivered are yet to be finalised, early tests of 4G beta equipment are already achieving remarkable results and these give us a good idea of what we can expect when 5G finally launches. The NGMN Next Generation Mobile Networks alliance states that for equipment to be considered 5G it must offer data rates of several tens of megabits per second to tens of thousands of users simultaneously, while a minimum of 1 gigabit per second should be offered to tens of workers on the same office floor. That statement is rather vague, but the signs are promising. Some estimates put download speeds at up to 1000 times faster than 4G, potentially exceeding 10Gbps. That would enable you to download an entire HD film in less than a second. Some sources state that 5G networks will be capable of transmitting data at up to 20Gbps. To put that in context, while LTE-A can theoretically achieve speeds of around 300Mbps, you’re not likely to get more than around 42Mbps in reality and standard 4G has real world speeds of just around 14Mbps. Nokia’s thoughts are similarly ambitious, with the company suggesting that you’ll be able to stream 8K video in 3D over 5G. Some estimates are more conservative though, but even the most conservative estimates put it at several dozen times faster than 4G. Existing 5G trials are taking place, with Verizon in the US for example showing that its technology can achieve download speeds of 30-50 times faster than 4G. That would enable you to download a full movie in around 15 seconds, versus around 6 minutes on 4G. The 5G Innovation Centre has achieved even higher speeds in test environments, of around 1 terabit per second (1Tbps). That’s roughly 65,000 times faster than typical 4G speeds and would enable you to download a file around 100 times larger than a full movie in just 3 seconds. However, that’s unlikely to be replicated in the real world. Indeed, in an actual-use environment (rather than a specially built test site), DOCOMO has recorded speeds in excess of 2Gbps, which is still extremely impressive. Closer to home, EE has begun trialling 5G speeds of 1Gbps. Ofcom for its part sees 5G as achieving real world speeds of between 10 and 50Gbps, which is insanely fast whichever end of the scale it ends up at. In short, it’s clear that it will leave 4G in its dust. Estimates of upload speeds are so far vaguer than those for 5G download speeds, but the consensus is that you’ll be able to upload data at many gigabits per second, possibly up to 10Gbps. The exact upload speed will of course be tied to the download speed though and whatever download speed is offered uploads will be slower, likely coming in at no more than half the download speed. Latency is how long it takes the network to respond to a request, which could be you trying to play a song or video or load a website for example. It has to respond before it even starts loading, which can lead to minor but perceptible lag and is especially problematic for online games, as each input has a new response time. Over 3G those response times are typically around 120 milliseconds and on 4G they’re less than half that at between roughly 15 and 60 milliseconds. The theory is that on 5G response times will drop to just 1 millisecond, which will be completely imperceptible. That will help with all the things we use data for now, but more than that it’s necessary for new mobile data uses, such as self-driving cars, which need to respond to inputs and changes in situation immediately. In early 2015, researchers at the 5G Innovation Centre (5GIC) achieved wireless transmission speeds of a jaw-dropping 1Tbps, far eclipsing the previous record set by Samsung in 2014 of 7.5Gbps and over 65,000 times faster than average 4G download speeds at the time. However, the speeds were achieved in tests under lab conditions, using custom-built equipment and over a distance of just 100m. Such speeds might just be possible in market conditions in the long term, but realistically they probably won’t be possible for a long time. Many operators and equipment vendors around the world have achieved remarkable speeds in 5G trials that are moving out of test environments and into the real world. However, they’re using different technologies and spectrum bands, for different applications and under different conditions, so are not directly comparable. Some of the more noteworthy achievements are highlighted here, which can give us a good idea of what to expect from commercial 5G services. November 2016, in partnership with Samsung, it achieved a data speed of over 2.5Gbps in a vehicle travelling 150km/h, demonstrating the viability of stable connectivity for 5G mobile devices in fast-moving vehicles. October 2016, with Huawei, it notched up a cumulative 11.29Gbps of data throughput (and sub 0.5ms latency) in an outdoor trial using 23 simultaneously connected devices. May 2016, with Nokia, successfully tested live streaming of 8K video over a 5G network (the transmission rates weren’t disclosed). February 2016, with Ericsson, it achieved a cumulative 20Gbps of data throughput in an outdoor environment with two simultaneously connected devices, with a downlink bit rate of over 10Gbps each. In separate tests the two companies achieved data throughput of over 10Gbps at a distance of 70m from the base station, and of over 9Gbps at a distance of 120m. Several other mobile carriers globally are busy working on 5G technologies, but for clarity and brevity we’ve listed their achievements under the key vendors in the 5G race. Many, like NTT DOCOMO, are collaborating with multiple vendors. February 2017, in partnership with Korea’s SK Telecom and BMW Korea, realised a peak downlink data speed of 3.6Gbps for a connected vehicle travelling at 170km/hr, and maintained throughput of over 1.5Gbps while data transmission was switched from one transmission point to another. December 2016, AT&T launched what it claimed was the first 5G business customer trial in the US, taking the technology it worked on with Ericsson and Intel into the field. It had reached speeds above 10Gbps in early tests with Ericsson. December 2016, implemented what it claimed was the first end-to-end 5G trial system and, in collaboration with Telefonica, demonstrated end-to-end data rates of over 1Gbps. October 2016, in partnership with Telia, demonstrated 5G capabilities in a real-world environment over a live outdoor network with peak rates of 15Gbps per user. September 2016, demonstrated 5G capabilities in a real-world environment over a live network in Australia with Telstra, achieving aggregate speeds in excess of 20Gbps. March 2017, achieved maximum speeds of 70Gbps in a 5G demo conducted with Norway’s Telenor in the E-band, which acts as a supplementary low frequency band to enhance the user experience. 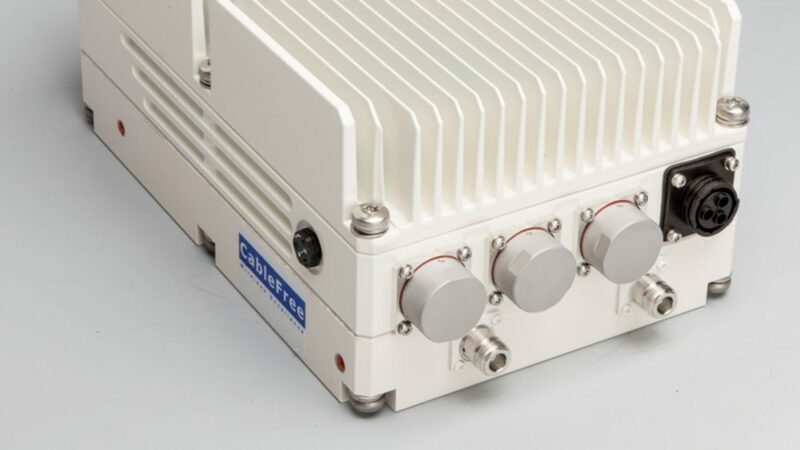 February 2017, with China Mobile, published the results of their 5G Dual Connectivity work claiming user throughput of over 22Gbps. February 2017, unveiled its 5G New Radio (NR) solution which, in tests of three scenarios, achieved over 10Gbps throughput for over one million simultaneous connections with latency under 1ms. Nokia is also heavily invested in 5G development, but has been coy about the speeds of any tests so far. Its AirScale radio platform is 5G-ready and on the market, and in October 2016 U.S. Cellular tested fixed wireless services in outdoor and indoor environments using AirScale, achieving speeds of up to 5Gbps. Nokia claims to have successfully carried out the world’s first connection based on Verizon’s 5GTF pre-standard, in December 2016, and early in 2017 it completed fixed wireless 5G tests with DIRECTV NOW, AT&T’s internet TV streaming service, also claimed to be a world first. 5G DATA TRANSFER SPEEDS OF 10Gbps and 8K Video? The headline numbers for 5G are all very impressive, but what do they actually mean? We can safely assume that 5G deliver data transfer speeds in the gigabits per second range. 1Gbps stands for billions of bits per second, building on from Mbps (millions of bits per second) in 4G and Kbps (thousands of bits per second) before that. 1Gbps is therefore equivalent to 1,000Mbps, and 5G will be the first time such lightning fast data downloads will be possible on a mobile device. Gbps transfer rates are common in underlying fixed networks transporting carrier data, but are still only a pipedream for most fixed network end users. The highest ‘super fast’ broadband available in the UK is from Virgin Media, offering download speeds up to 200Mbps. The ‘up to’ is important as this is the maximum possible speed, the actual speed will depend on a variety of factors from cabling to distance from the telephone exchange. In the US, the likes of AT&T and Google Fiber offer 1Gbps connections but only in select markets. It’s nigh on impossible to quantify video download rates over technologies that are currently available, because there are so many different variables. Over 4G the rates will depend on the coverage, signal quality, device type, how many people are using the network at the time, the quality of the video and whether it’s downloaded or streamed, and a whole host of other factors. In fact, comparing 5G download rates with 4G is a somewhat spurious exercise because of the huge disparity in speed rates and the fact that peak download rates will rarely be maintained for the duration of a 4G download. According to AT&T, at 1Gbps you can download 25 songs in under a second, a TV show in under three seconds and an HD movie in less than 36 seconds. These rates are currently available over its fixed GigaPower ultra-fast internet service and it has indicated the same will be possible over 5G at 1Gbps. Qualcomm, on announcing its new X50 5G modem in October 2016, said it would be able to download a 1.5GB film in two to three seconds, compared with 10 to 15 seconds at 1Gbps. But 5G will need to cope with much more than HD video content, as 4K and even 8K video are already underway. 8K video has a bit rate four times greater than 4K video and 32 times greater than full HD. NTT DOCOMO and Nokia’s May 2016 video download trial successfully compressed and transmitted without delay an 8K video at 48Gbps. Some significant speeds have been achieved in 5G tests and trials, but real-world availability is still some way off. The first pre-commercial services are expected to launch this year, notably by Verizon, which is aiming to test services in 11 US metropolitan areas covering “several thousand customer locations”. However, it’s given no indication of what speeds it hopes to be able to deliver or what smartphones its trial customers will use. 10Gbps is widely accepted as a realistic expectation for 5G when it is fully commercially available, but it’s unlikely that early services will achieve such speeds from the outset. Even if the networks can support such speeds we will all need compatible high-end smartphones to be able to exploit them. However, even if 1Gbps is the norm in the early days of 5G – and that is entirely possible given what’s been achieved in trials to date and the devices that are under development – that is still a significant improvement over 4G or even home broadband. Furthermore, the data transfer rates should be stable for an entire download, unlike 4G where peak transfer rates very rarely last for the duration of a download.